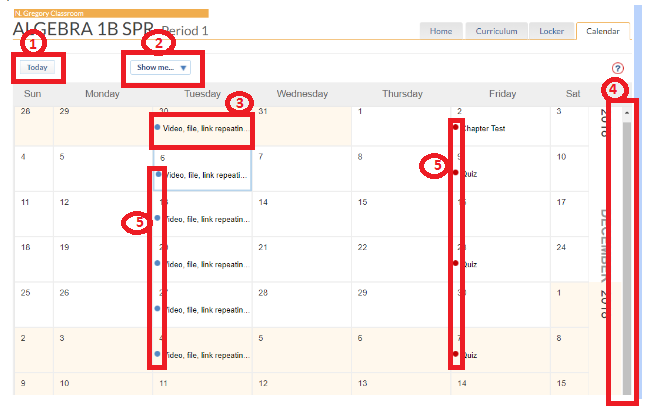 All course units, lessons, assignments and events are displayed on the calendar. 1. The Today button will scroll the calendar back to focusing on today's events. 2. Filter your view of the calendar using the Show Me menu. 3. Click on an existing item's title to view its details, submit work, or post a discussion. 4. Scroll the calendar up or down to view previous or upcoming months. 5. 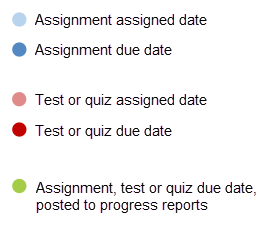 Colored dots next to each assignment, test or quiz indicate its status. The legend is given below.